It’s time for my next project for the Crafts-U-Love design team and I decided to do something a bit different for today! I received some pretty Prima Marketing 12×12 paper and the Marianne Designs Rosettes & Labels Collectables dies. Although I have MOUNTAINS of patterned paper, I rarely use it nowadays as I prefer to make my own backgrounds, but I was determined to include it in my DT card for today! I decided that an ‘impossible card’ would be a great way to show off that pretty paper. I started by drawing the cut and fold lines on my base card in pencil and then cut it in the three places as indicated by the unbroken line. The key with this project is to make sure that the three vertical cuts reach the horizontal centre (dotted) line. Firmly hold the left side of the card and then twist the right side of the card up and then back. 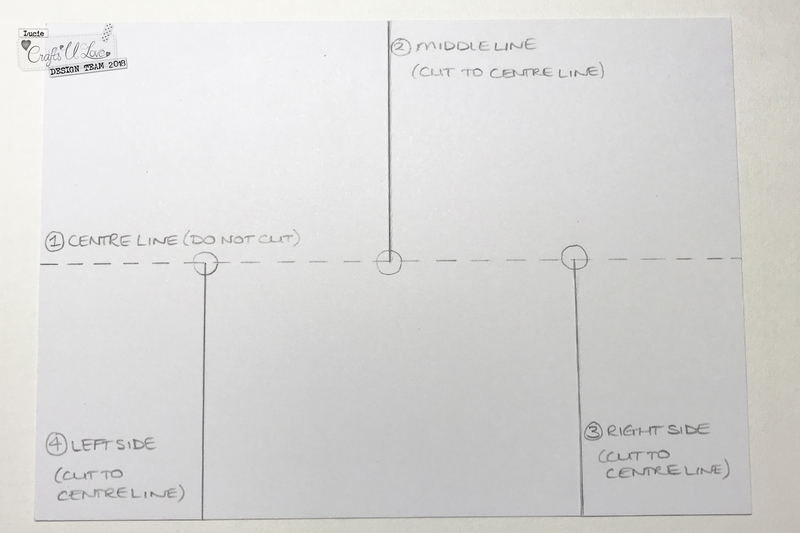 Fold along the centre – use a bone folder to smooth down the fold/crease. Lift up the centre rectangle and fold backwards. Use the bone folder to ‘sharpen’ the fold. The centre flap should stand up of its own accord. Step 4 – decorate the creation! And there you have it, the impossible card, ready for decoration! I erased the visible pencil lines and adhered patterned paper. I added the rosette which I had made with the Marianne Design dies and a Penny Black stamp. To finish off the card, I added a few die cut stars. This is what the card looks like from the reverse and underneath (obviously I’d erase my pencil marks before using the card!). I still can’t believe how this can be created from one sheet with a couple of cuts and folds! The card can be flattened and popped in a regular envelope.